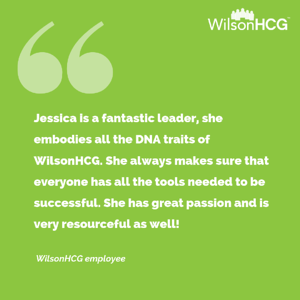 Jessica Ward, a Talent Attraction Manager at WilsonHCG, is one of our finalists. She is based in Minnesota, USA. A Flamingo. Flamingos always maintain their individuality whether they are standing alone or in a group. They are social birds and form strong bonds to those in their flock. Not to mention they are vibrant, and resourceful, and have great balance. My go to is always Helen Keller but as my girls are growing up, I find myself talking to them about many strong and determined woman who used their voices and positive actions to pave the way for others to follow. Our history is filled with women who made a difference and these women are remarkable in their own rights. Marie Curie, Eleanor Roosevelt, Nancy Reagan, Amelia Earhart, Maya Angelou, Gloria Steinem, Malala Yousafzai, and Lucille Ball to name a few. There are so many others who used their voice/minds to bravely carry on a path less traveled not out of pity or the need for fame, but rather to show others the possibility, the faith, and the equality needed in the world. We are not one, we are many. Leadership is more than just a title - it is someone who steps up to make a positive impact and shares their knowledge so others can move forward with them. It is someone who is not afraid to make a mistake or fall forward. A good leader let’s others shine around them instead of themselves because they are passionate about seeing others succeed. Do not be scared to take the leap into something new, as you can not discover new things if you do not lose sight of the shoreline. At the end of the day, just stay true to you, communicate often, be a change agent, empower yourself and others, and rise to the occasion naturally. Since Heaven does not have visiting hours, I would trade one day here on Earth with a friend’s loved one in Heaven. This way they could get time with their loved one and I could see my loved ones in Heaven. To travel anywhere with my husband and kids. Seeing the world’s beauty is one thing but seeing it through the eyes of a child is pretty amazing. I am a night person more than a morning person but it can be easily influenced depending on the coffee intake! One of my many quirks is my ability to retain songs from the 50’s to the present. It has proven to come in handy when there is a need to inspire, laugh, or just bust out into song- not to mention the trivia games I win! Jessica Ward graduated from St. Cloud State University in St. Cloud, MN, with a bachelor’s degree in education. She is a Talent Attraction Manager at WilsonHCG, and her prior experience is in career advising and management. Her experience allows her to connect with ease to candidates and help them achieve success.